Udupi, Nov 29, 2015 : Padma Shenoy, writer, said here on Nov 28, Saturday that there was good scope for women’s literature in Konkani language. She was presiding over the inaugural function of the two-day Konkani women’s literary and cultural conference titled ‘Konkani Matha’. Writer Padma Shenoy, who is also the president of the Sammelan, said the present century had seen women’s literature in Konkani getting a lot of importance. Many good articles and essays were being received at Konkani seminars and conferences, which was a positive sign, she said. Every literature has a tradition. Reading literature of a particular language gives an insight into the lifestyle and culture of a community. When one traced back the origins of Konkani literature, Krishnadas Sharma’s work ‘Raghunathachi Vamshachi Katha’ written in the 16th Century was one of the earliest works in Konkani, she said. It was essential for people of the Konkani community to transmit their language and culture to their future generations. But due to the onslaught of modernisation, joint families had given way to nuclear families. People were now living in two-bedroom flats. Couples feared that the grandparents might not come out of their age-old mindset, she said. But it was essential that they took care of their elders. “Make a little space for your parents in your hearts, you will automatically find solutions to all the problems,” she said. Grandparents had a treasure trove of knowledge and were a great source of good stories with moral values for their grandchildren, she said. The children too would learn the joy of living together and respect the elders, she said. Rise in the incidents of terrorism, drug-peddling, atrocities on women and increase in the prices of essential commodities due to hoarding, were a cause for concern, Ms. Shenoy said. A display of Konkani cuisine, old coins and antique products, and an art exhibition were also held at the venue. 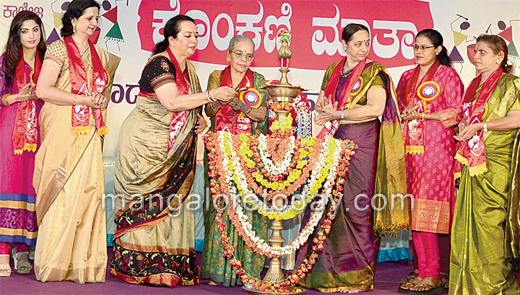 Five eminent women were felicitated on the occasion. They are: Vandana Shanbhag (sports), Malati Sagar (drama), Rajashree Shenoy (dance), Anuradha Dhareshwar (music), and Sabita Monis (special felicitation). Laxmi S. Rao, Sammelan working president, welcomed the gathering. Aishwarya Nag and Neetu, film actors, and others were present.